Here are some case studies that you might find helpful. Ice&Fire: produced an excellent leaflet to encourage audiences to take action. ice&fire founded in 2006 Actors for Human Rights a network of 700+ actors who perform rehearsed readings of documentary scripts made up of testimonies from real people. Themes include the UK’s immigration and asylum system, the impacts of ‘austerity’ policies, women’s rights, sexual violence in conflict and more. Performances are almost always free to attend and take place in just about any venue. 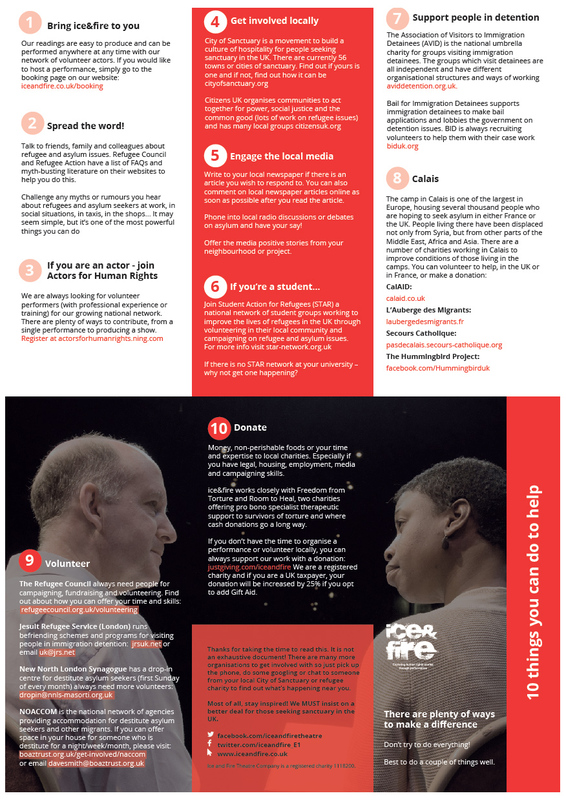 ice&fire has also produced a simple, ‘10 things you can do’ leaflet. It is distributed both physically and digitally to audiences and supporters moved to act. Where possible, performances are followed with a Q&A, allowing audiences to deepen their understanding and provide signposting for people wanting to take action. Cardboard Citizens: performed their play at the House of Lords to influence decision makers. Cardboard Citizens partnered with Crisis to recruit member actors, who approached Local Authorities as homeless ‘mystery shoppers’. Their experiences fed into a campaign supporting the Homelessness Reduction Act and raised public awareness through appearance in Channel 4’s Dispatches. Alongside this, Cardboard Citizens ran a successful national tour of Cathy; a play about a mother and daughter becoming homeless. The play was performed to the House of Lords, alongside Cathy Laws suggested by 600 audience members from the tour. With the Homelessness Reduction Act passed in May-17, Cardboard Citizens is now delivering training to Local Authorities, supporting them implement the changes the Act pushed for. Kidscape: worked with 16-18 year olds to create a play about bullying and developed resources for teachers. Masterclass and Kidscape spent over a year working with 16 to 19 year-old students, collating and exploring fresh material. These ideas fed into the creation of Cookies, a play about cyberbullying that was performed in the West End but also livestreamed to a wider audience. A film of the play accompanies free PSHE and Drama resource packs which include advice on cyberbullying from Kidscape, easy-to-follow exercises and over 30 extensive theatre-based, written and creative activities that align with the national curriculum. 2Magpies: collaborated with charities, held post show discussions and created a flyer to raise awareness. 2Magpies is a theatre company created by two International Security and Terrorism MAs, who use theatre to draw attention to and provoke conversation on social issues. In 2017, Last Resort was conceived to challenge audiences to reflect on activities taking place in Guantanamo and encourage them to act. 2Magpies invited various charities to see the first performances and then worked with Reprieve to build a mutually beneficial collaboration that drew attention to issues surrounding detainees and mobilised audiences to respond. Initially, 2Magpies prioritised understanding the charities aims to find out what they wanted to get from working together. For the live performances, 2Magpies also worked with Reprieve to plan workshops, post-show discussions and an exhibit based on Guantanamo detainee artwork to tour alongside the play. Clean Break: took plays about women in the criminal justice system to decision makers to change opinions. Clean Break is a theatre company that produces art with and about women in the criminal justice system. Part of their work involves co-creating plays with women in prison and women who have been released, harnessing the power of theatre to support their exploration of expression and creativity. Founded in these experiences and stories, Clean Break commissions playwrights to generate material that can be taken to decision making audiences as well as the general public. These plays have been taken to the Parole Board Conference, the Ministry of Justice and the Houses of Parliament, in the knowledge that greater empathy and understanding has the ability to change hearts and change minds.